This graphic was originally published by Sohu Business. It has been translated and adapted for ChinaFile by David M. Barreda. Who are China's rural migrant workers? A uniquely Chinese social identity, the category of “rural migrant worker” is a product of China’s urban/rural dichotomy. It refers to a class of citizens no longer employed in the agricultural sector who nevertheless retain their legal status as nongmin (“peasants”). Of China’s 263 million “peasant laborers” more than 60% are migrant workers, living in cities but legal residents of the countryside. They form the main body of China’s notorious New Year’s transportation rush. 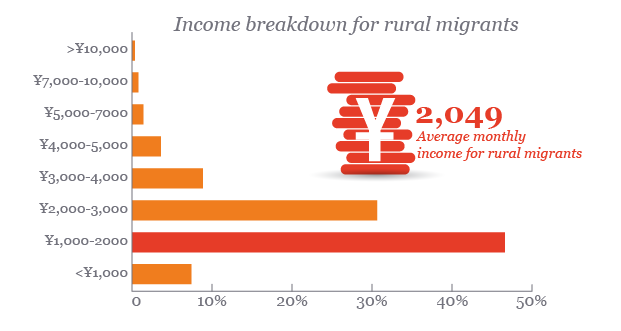 Most rural migrants are employed in private enterprises or run their own businesses. In sum, rural migrant workers are a sector of the population who work in Chinese cities but are still legally considered residents of the countryside. The average level of education for rural migrant laborers is low, and they are for the most part self-employed or work in private businesses. 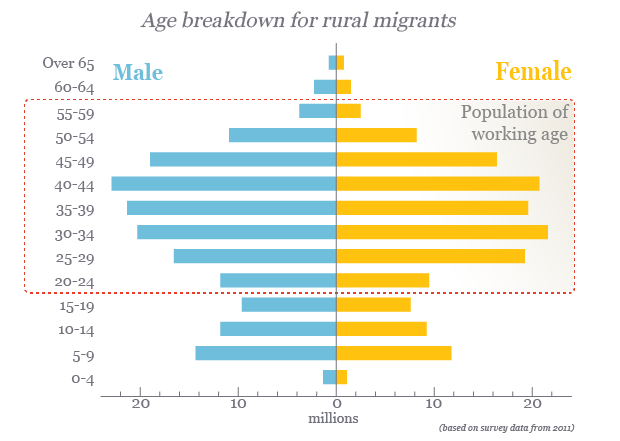 The majority of rural laborers who migrate to the cities are of working age. They are the main source of cheap labor for China’s factories. Rural migrant labor is a powerful driving force behind Chinese urbanization. 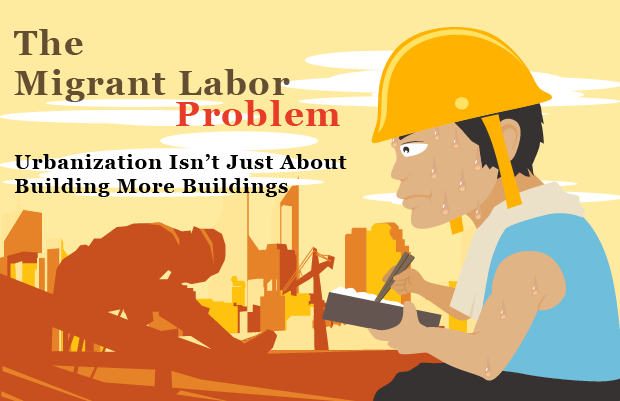 Besides working in the manufacturing sector, most migrant workers find employment on construction crews, and it is they who have built most of China’s cities. The migrant worker class is overwhelmingly low-income. Though in some regions where labor is in short supply employers have trouble finding suitable workers even for a wage of ¥3000 (U.S.$480) per month, the average monthly income for rural migrants in most cities nationwide is between ¥1000 and ¥2000. They occupy the bottom rung of the urban social ladder. Though rural migrant workers spend their youth laboring in the cities, they do not receive the compensation they deserve. Their income remains extremely low compared with the nationwide average. 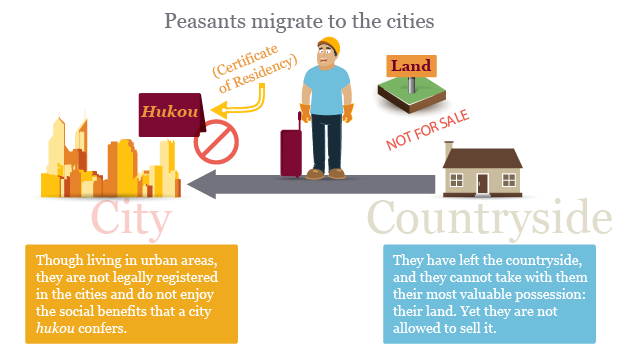 Most rural migrants living in cities are just passing through, so they usually rent instead of buy. Government-provided affordable housing is extremely undependable, accommodating only 0.2% of rural migrants. 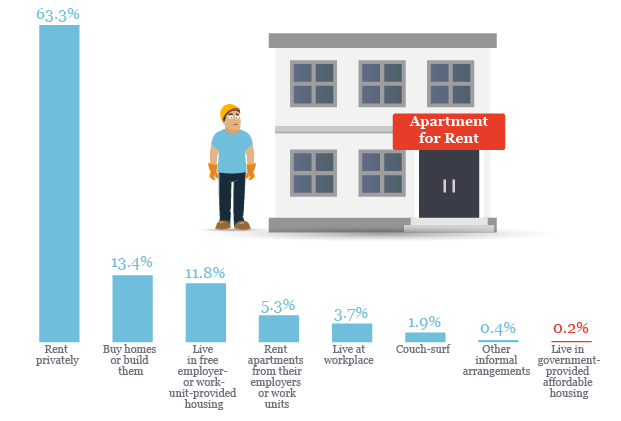 Besides housing, the lack of a social safety net is a major issue for migrant workers. In the countryside, relatives, neighbors, and children form a basic social safety net. But in cities, where traditional rural support structures have dissolved, migrant workers are unable to avail themselves of public services. ...so the majority of migrants don't consider themselves city dwellers. They don't feel that they belong. What obstacles prevent rural migrants from assimilating into city life? Conclusion: Urbanization isn’t just about real estate; it’s about people. Rural migrants need to be able to put down roots in cities or the problems of urbanization will never be solved. Building more housing isn’t the solution, and in the end it will just result in ghost towns.